Bastrop is the county seat of Bastrop County, Texas, and is located about 30 mi (48 km) east of Austin at 30°6'43" North, 97°19'1" West (30.112057, -97.316838). 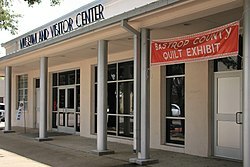 Bastrop was settled by Europeans in 1804 and incorporated on December 18, 1837. The population was 7,218 according to the 2010 census. Bastrop Chamber of Commerce, 927 Main Street, +1 512 303-0558. M-F 8AM-5PM, Sa 10AM-3PM. Visit the Chamber and pick up a free visitor's guide. If the chamber is closed, guides may be found in the box by the front door. The Bastrop Advertiser is the oldest semi-weekly newspaper in the state of Texas. It publishes twice a week and can be purchased at most area convenience stores for $0.50. Austin Bergstrom International Airport (AUS IATA) is 30 miles (48 km) west of the city center. The most practical means of travel from the airport is by rental car but taxis are available. A one-way trip by taxi is about $40 (credit cards accepted). Bastrop Opera House, 711 Spring St, ☎ +1 512 321-6283. Professional theater productions in a historic building built in 1889. Bastrop Skate Palace, 488 Hwy. 95 N, ☎ +1 512 303-0320. Sessions Sa-Su 1PM-4PM. Large indoor roller skating rink. Bastrop State Park, Texas State Hwy. 21 (about 1 mile east), ☎ +1 512 321-2101. Su-Sa 8AM-5PM (to 7PM in summer). Located among the "Lost Pines of Texas," this 3,500-acre park has a swimming pool (summer only-fee), golf course (fee), a 10-acre lake, hiking trails, picnic tables, tent and RV campsites (fee), and 13 cabins (fee). $4 per day, per person 13 and older. ColoVista Golf Club, 100 Country Club Dr, ☎ +1 512 303-4045. Lake Bastrop. This 906-acre lake offers recreational facilities in two parks, one on the north shore and one on the south shore, for boating (fee), fishing, swimming, water-skiing, picnicking, and camping (fee). Lost Pines Golf Course (inside Bastrop State Park), ☎ +1 512 303-1369. McKinney Roughs Nature Park, Texas State Highway 71 (8.4 miles west of Bastrop), ☎ +1 512 303-5073. M-Sa 8AM-5PM; Su noon-5PM. Closed on major holidays. Great hiking. $3 for adults, $1 seniors, no charge for children 13 and under. Pine Forest Golf Club, ☎ +1 512 303-6777. White Lightning Ranch, 601 Pine Tree Loop, ☎ +1 512 680-0463. Horseback riding-great horses and very nice lady. The Sugar Shack, 114 Loop 150 W, ☎ +1 512 321-3777. As the name implies, all kinds of sweet treats to be had. Naturally Country Clothing, 601 Chestnut St, ☎ +1 512 321-7002. Berdoll Pecan Farm, 2626 State Highway 71 W. Cedar Creek. Tasty treats and gifts. K M Skin Care, 601 Chestnut St, ☎ +1 512 303-7302. Bealls (Hwy 71 at Hasler). Department store with a focus on clothing. Portia's Pet Emporium, 926 Main St. Fun pet supply store where "animals are welcome to bring their owners". Roadhouse, 2804 Hwy 21 E, ☎ +1 512 321-1803. Best burgers. Chicken Express, 107 N. Hasler Blvd, ☎ +1 512 321-6800. Great sweet tea! Buck's Pizza, 1007 Hwy 71 E, ☎ +1 512 321-0400. Cripple Creek & Company, 928 Main St, ☎ +1 512-332-2477. Wine boutique, food and coffee, children's toys (Melissa & Doug, Klutz), wine accessories. Cartwright's Famous Bar-B-Que, 490-A Hwy 71, ☎ +1 512 321-7719. $Mid-range. Billy's Pit Bar-B-Q, 110 Hwy 71 W, ☎ +1 512 321-6453. Simple barbecue, Texas style. The food is tasty. China Chef, 300 Hwy 71 W, ☎ +1 512 321-9802. Chinese lunch and Sunday buffets. MaMa Mia's Italian Garden, 904 College St, ☎ +1 512 321-7808. Tu-Th 11AM-9PM, F-Sa 11AM-9:30PM, Su 11AM-3PM. Lunch buffet daily 11AM-2PM. Anita's Cafe, Main St, ☎ +1 512 303-9693. Solid Tex-Mex eatery. Consistently good food. $Mid-range. Vallarta Jalisco, Hwy 71. Mid-range. Guadalajara Mexican Restaurant, 494 Hwy. 71 W, Suite 180, ☎ +1 512 321-3002. Su-Th 11AM-10PM, F-Sa 11AM-11PM. Mid-range. Shady Oaks Restaurant, Hwy 71 W (about 4 miles out of town between Bastrop and Austin, just west of where Hwy 21 merges with Hwy 71), ☎ +1 512 303-6447. The place looks suspect and the tables are a mish-mash of old dining sets and folding tables and chairs, but this place has great, down home, Southern style, stick to your ribs, kind of food. The Mexican plates are particularly good at a good price. Mid-range. Texas Grill, 101 Hwy 71, ☎ +1 512 321-5491. Open 24 hrs. Country café, chicken fried steak. Cafeteria style lunch. Breakfast anytime. Big Mouth Southwestern Grill, 912 Main St (in the middle of Downtown Bastrop), ☎ +1 512 332-0074. Beautiful setting, great food, live entertainment, full bar. Baxter's On Main, 919 Main St, ☎ +1 512-321-3577. Mid-range. Casual fine dining. Boots (Hwy 95 just past FM 1441). Beer and wine only. Live music, pool tables, DJ, and more. No kitchen. Budget. Leon's Country Store (FM 535 in Rockne). Quaint old beer joint, convenience store, & feed store. Lone Oak Bar (FM 1441 across from Boy Scout Camp). Beer joint with great old country jukebox. 30.163384-97.4451851 Hyatt Regency Lost Pines Resort and Spa, 575 Hyatt Lost Pines Rd (About 10 miles west of Bastrop), ☎ +1 512 308-1234. Resort and spa situated on 405 acres (260 ha) of Central Texas landscape, adjacent to the 1,100-acre (440 ha) McKinney Roughs Nature Park along the Colorado River. Equestrian center, golf course, swimming pool with water slide. Comfort Inn, 106 Hasler Blvd, ☎ +1 512 321-3303. Two story motel. Pecan Street Inn Bed & Breakfast, 1010 Pecan St, ☎ +1 512 321-3315. Located in a historic landmark home. Buttonwood Row B & B, 1402 Hill St, ☎ +1 512 303-5664. Located in a historic landmark home. Blue Heron Bed and Breakfast, 583 Union Chapel Rd. Cedar Creek. Just east of Austin on Hwy 71 towards Austin. Bastrop Inn, 102 Childers Dr, ☎ +1 512 321-3949. Days Inn, 4102 Hwy 71 E, ☎ +1 512 321-1157. Two-story motel. Holiday Inn Express Hotel & Suites, 491 Agnes, ☎ +1 512 321-1900. Three-story motel. Tropicana Motel, 103 Hwy 71 W, ☎ +1 512 321-2526. Looks like it was built in the 1950s or 60s. Pool. Best Western Inn of the Pines, 3110 Hwy 71 E, ☎ +1 512 321-6000. Two-story kind of by itself. Bastrop River RV Park, 98 Hwy 71 W, ☎ +1 512 321-7500. Gated, paved, propane available, walkway to deck on river bank, swimming pool. Hobo Camp RV Park, 307 FM 1209, ☎ +1 512-332-2267. Bastrop is 30 minutes (off rush hour) from Austin. The drive in to Austin on Hwy 71 is lined with antiques, gift shops, a flea market, a fossil and bonsai store, and many more central Texas cultural venues. Or you can go to Smithville to shop antiques and country kitsch. Or go to San Marcos for the outlet malls. This city travel guide to Bastrop is a usable article. It has information on how to get there and on restaurants and hotels. An adventurous person could use this article, but please feel free to improve it by editing the page. This travel guide page was last edited at 11:56, on 12 April 2019 by Wikivoyage user DaGizza. Based on work by Wikivoyage users Traveler100bot, Traveler100, Eco84, Wrh2Bot, Ground Zero, WOSlinker, Wrh2 and Ikan Kekek, Wikivoyage anonymous user 66.68.127.168 and others.